Yay, it's Thursday which means we're one day closer to the weekend! I've had a bit of a rough week with not feeling so well, but I'm feeling much better today. Nothing serious (I hope! ), I just think the stress of the season is slowly getting to me. But enough about that, I'm SO excited to share this holiday look with you guys today. It's a bit more glam than I usually do, but after I spotted this dress, it was kind of like game over because the sequins totally got me. And the other thing that I love about this dress is that it's not form fitting! Can I get an amen for that? That means that you can eat and drink at your next holiday party without worrying if the Spanx are keeping everything in or not. I will say that it is a true mini dress, so if you're worried about having to worry that you'll accidentally have a wardrobe malfunction type of thing, then I would wear faux leather leggings underneath so that you're covered. In fact, when I saw this dress, I was like OMG, I'll do a "how to wear this dress two different ways" which would've included it being shown with leather leggings, but because of time constraints and because I was too eager to share this dress with you, it never happened. But just know that I would style it with tights or faux leather leggings if you're worried that going bare is too risqué for you. And speaking of bare, I kept my accessories pretty simple because the dress pretty much is the star of the show. Okay, it looks like Vivi is up from her nap. Hope you guys like this look! It's such a fun party dress, so perfect for the holidays! 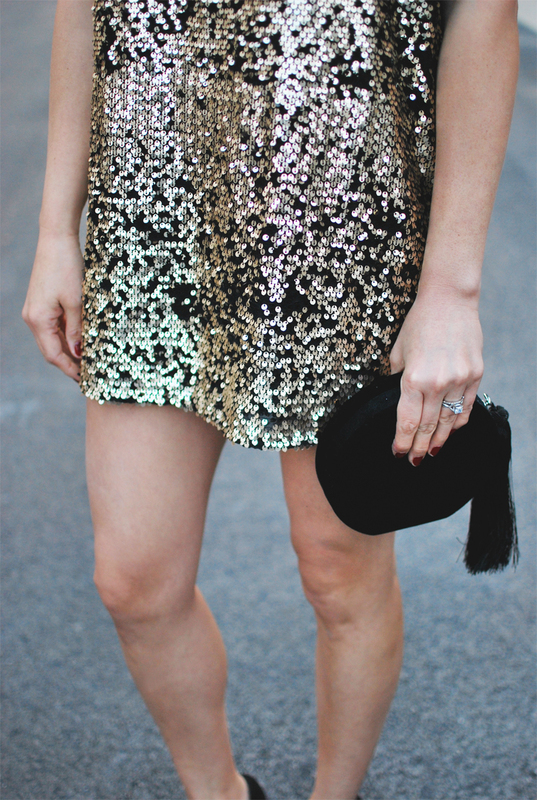 Would make a great New Year's Eve dress! Nice Photo . . ..